If you are a coffee connoisseur, then you know that nothing can compare to the fresh brew that is produced by a French press. Of course, you are probably equally aware that it isn’t all that easy to find a French press that can create the delicious cup of Joe that you are looking for. This is because there are a lot of elements to think about when choosing the perfect product. You need a French press that has an excellent seal, good plunger, is of an appropriate size and looks attractive. Since there are quite a few factors that you need to pay attention to, we decided to help you out with this particular process. One of the features that we really enjoyed over all of the others is the four-level filtration system. Now, there is no denying that one of the least fun parts about using a French press is all the residue that you have to deal with. However, with this filtration system, all that is taken care of. So, you get to enjoy a purer brew without having to worry about finding grinds in your drink. The other perk is that this product is actually a great option for a family. This is because it is able to hold up to 34 liquid ounces, which rounds up to several cups. So, everyone can enjoy a cup of coffee without having to constantly make more. There is also the fact that this French press is made from materials that are completely safe for you. These include BPA free plastic, thermal resistant borosilicate glass, and food-grade stainless steel. 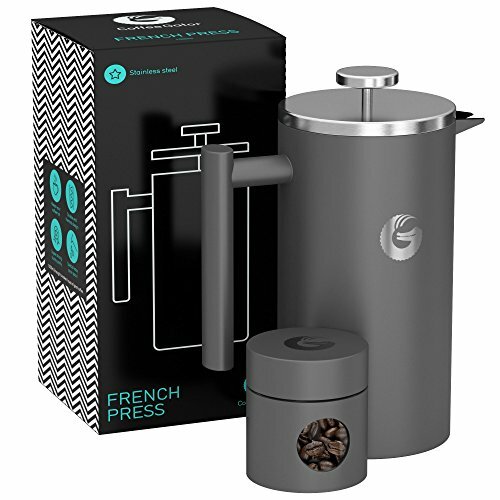 What’s more, there is a lifetime guarantee that comes along with it, assuring you that this is actually a very high-quality French press. The only real downside with this product is the fact that the glass is rather thin. Due to this, heat is continuously lost and you can’t keep your coffee warm for too long. There are a few things worse than pouring out a cup of coffee and taking a sip only to find that it is cold. Fortunately, with this French press, you will not have worry about it anymore. See, it is made from 304 stainless steel that it is incredibly thick and it also contains a vacuum-layered interior. As a result, the press is able to lock in the heat for that much longer, sometimes up to an hour! Not only does this thickness work to keep your coffee hot, it also ensures that your press is incredibly strong as well. So, even if you happen to drop it a few times, you can rest easy knowing that there will be no damage done. The other thing that we really liked about this product was the spring-loaded, double-screen filter. This works to create a clean brew that still embodies a rich, delicious flavor. 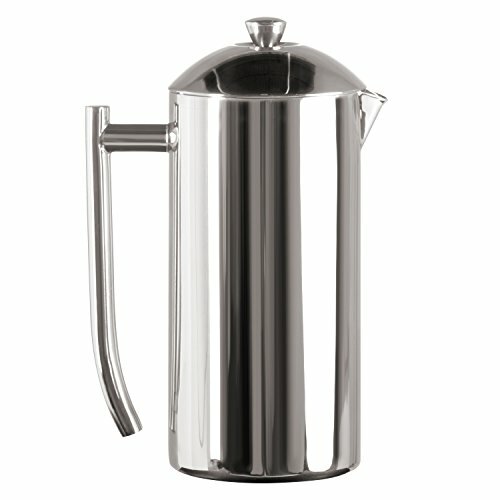 Last but not least, this French press is capable of holding up to 34 ounces at any given time. You can make a large amount of coffee early in the morning and enjoy it slowly, knowing that the heat will not escape. The only real flaw that we could find with this French press is that it can be a bit tricky to clean. It is difficult to pull apart the plunger, meaning that you have to spend a bit more time on the clean-up process. If you want to make sure that absolutely no grounds are getting into your daily cup of coffee, then this is the French press for you. Its secret weapon is the 3-layered stainless steel filter that is excellent at trapping even the smallest grinds. This means that you get to enjoy your cup of Joe without having to worry about any chunky surprises. The taste of your coffee is further improved by the screens provided with the press. They help to refine the flavor, making each cup a delight. Now, it should be noted that these screens can be a bit difficult to pull apart and clean so you should use them with caution. Yet another thing that is great about this French press is that it is incredibly durable. It is made from high-quality stainless steel that ensures that this is a product that is going to last you a while. This model is also really great at keeping your coffee warm for an extended period of time, allowing you to drink your coffee at your own pace. This is good news considering that this press can hold 34 ounces. Despite this, both the handle and the knob are safeguarded against the heat, making certain that you won’t hurt yourself. There really is a lot to like about this French press. To start with, the design makes it easy to hold and use so there is no chance of you spilling coffee everywhere. At the same time, this press also boasts a 2 stage filter system. This means that your coffee is pre-filtered before it is passed through a filter with an even finer mesh so that all of the sediment is trapped. So, you can be quite certain that absolutely no grounds will be escaping into your drink. The press is also well-built and is made from strong stainless steel that will not dent or bend in any way, thus lasting you longer. This material and the fact that the press is double-walled means that your coffee gets to stay nice and warm for much longer. Therefore, you won’t have to hurry up and gulp down your coffee just to retain the heat. Now, this French press is meant to hold up to 36 ounces. However, there is a small caveat here. See, you can’t actually fill the water up to the typical position. If you do so, the grinds and the water will squirt out. This means that you have to fill it up to a lower level. As a result, you only really get about 33 ounces or so of coffee. 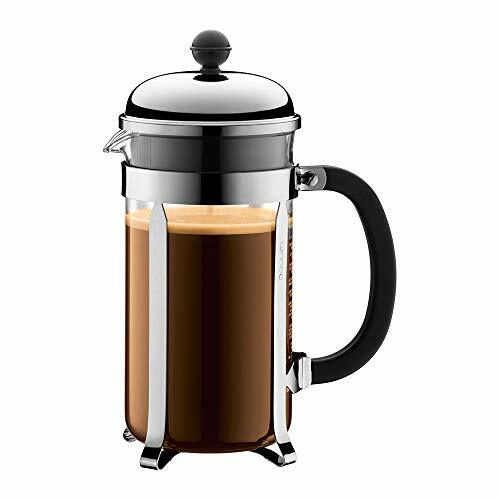 Bodum is a household name when it comes to French presses and this model shows just why that is. To start with, this French press produces an incredible flavor. This is because the 3-part plunger and the mesh filter work in perfect harmony to strain out all of the grinds while trapping the important oils in your coffee. The result is a smoother, more refined taste with every sip. Also, because it is made from glass, it is a lot easier to see the water and coffee level as you are brewing your drink. Speaking of which, this product has been built to hold up to 34 ounces, which will work out to at least a few cups. You do, however, have to be careful with this French press. Now, the stainless steel portions of this product are strong and durable, with a long lifespan. What isn’t quite as tough, however, is the glass beaker. So, when using it and cleaning it, you do have to exercise some caution. 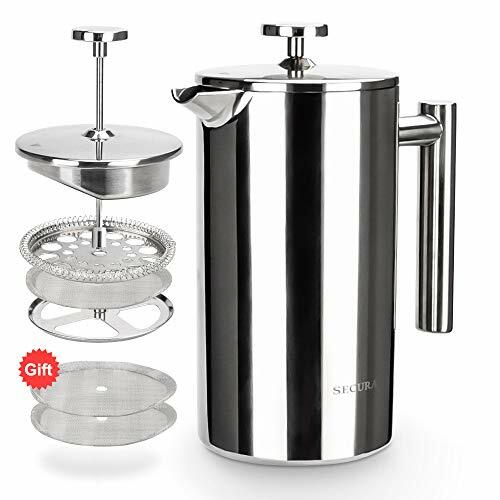 Apart from this, though, you will find that this is a well-designed French press that works well to produce an excellent cup of coffee. Here are some of the things that you should pay attention to when choosing your own French press. This is the more traditional design and one of the things that people enjoy most about these coffee makers is the look of them. Plus, it is nice to be able to see your coffee as it is being made. Of course, this isn’t the only advantage offered by these French presses. Since they are made of glass, you can be quite certain that you will not be bothered by any kind of aftertaste. Also, there is no need to worry about rusting or similar issues. Now, that being said the major disadvantage with these French presses is their fragility. Depending on the type and thickness of the glass, these can be rather fragile so you will need to be careful. What most people like about stainless steel French presses is that you don’t have to worry too much about how you use them. Most of these presses are hardy and can withstand a bit of knocking about. These are also great at retaining heat and are typically a lot better at keeping your coffee warm. Also, they are good for travel purposes as well. What can be a bit annoying about these French presses, though, is that you can’t see the water level, making it a tad bit difficult to judge how much you are pouring in. There is also the fact that the cheaper versions can impart a slight metallic taste. With a French press, you do have to take some care with the plunger. This is because this feature will determine whether or not you are able to enjoy a clean brew. More specifically, however, you should pay attention to the seal around the plunger. The cheaper French presses will have either a plastic or a rubber seal. The problem is that these tend to disintegrate the more you use the product. Eventually, it will start letting the grinds through, making the coffee undrinkable. This is why you should only settle for plungers with a mesh metal filter. Although it may not look like it, this filter actually acts as a seal. Even better, these filters don’t deteriorate, and thus, you can enjoy a high-grade cup of coffee each and every time. Are you someone who likes to drink a lot of coffee or can you make do with a single cup? If the former describes you best, then you need to think about the size of the French press. After all, if you get one that is too small, you will find yourself having to constantly wash out and re-use the product. To avoid this, you should look for a beaker that can hold at least 34 ounces. This should provide you with a few cups of coffee and is also a good option if you have a few more coffee-drinking members in the family. Insulation: if you want your coffee to stay warm for longer, you need to find a beaker that is properly insulated. For stainless steel presses, vacuums work best. On the other hand, if you want to stick with a glass French press, then you should look for one with a double-walled construction. Usability: look for a French press that has a comfortable and non-slip grip. 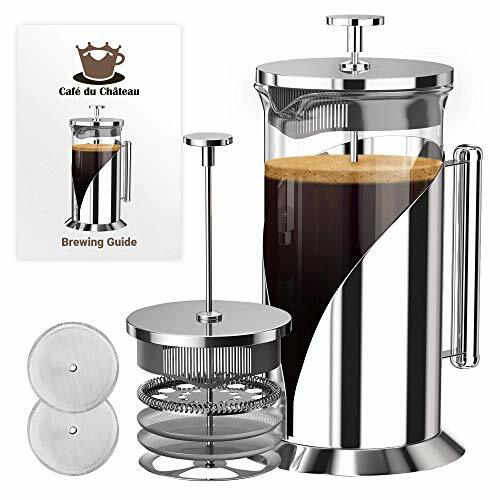 This will be useful for when you are pouring yourself a cup of coffee or if you want to move the press from one place to another. Easy Cleaning: unless you want to spend a lot of time washing out your French press, always opt for one that can be easily dismantled so that you can deep clean it without a problem. This will also make it simpler to keep the whole system more hygienic as well. As you can see, when choosing a French press, you need to choose one that is suitable for your needs, is durable, has a great plunger, and can keep coffee warm for long periods of time. If you are looking for more budget-friendly options, you will see that the Cafe Du Chateau and Secura French press fit the bill perfectly. On the other hand, if you want a delicious tasting brew, then you should definitely stick with the Bodum Chambord French press. If durability is what you are after, the Frieling French press will prove to be a long-lasting companion. However, if you are most concerned with drinking piping hot coffee each and every time, the Gator French press should be your top pick. These are all of the elements, features, and advice that you need to determine which French press is worth your investment.